10th Classics on the Green event at Friston, Saxmundham, Suffolk, IP17 1NP. 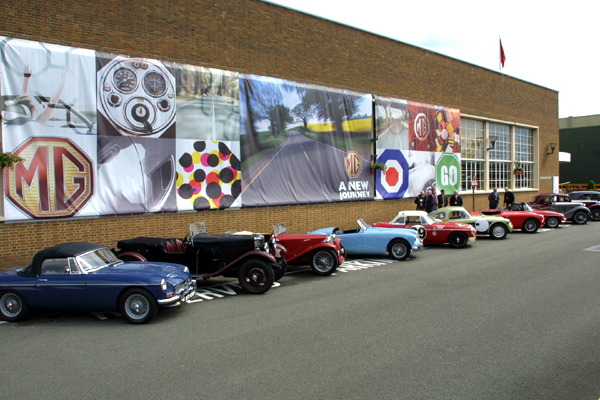 All veteran, vintage and classic cars, bikes and other vehicles in production up to 1970 are welcome. Opening from 3pm until around 9pm. Arrive and depart when you like. Refreshments in the village hall, bar and BBQ on the Green and at the Old Chequers pub. No need to book and entry free. However, donations would be gladly accepted for the village church. Please contact Tony Morley for more details (see number/email below). Join Louth area MGOC for their annual event. Meet at The Brackenborough Hotel Louth for registration and breakfast, then approx 80 mile run around Lincolnshire to finish at Uncle Henry's Farm Shop. £26 per car, includes two occupants, breakfast, route book, rally plate, finishing plaque etc. All proceeds in aid of Lincs and Notts Air Ambulance. The Chesterfield Club’s 40th Anniversary Year. Join them on their run for the Derbyshire, Leicestershire & Rutland Air Ambulance. Did you used to attend Tim Hipwell's events at Cricket St Thomas in the past? If so, you may wish to join Cambridge MGOC in 2019. It is intended to be a very informal ‘do as you like’ week. No set activities, just a chance to meet up with other MG friends. If you would like any further information please email (see below). To book your place please contact Charles Lister (see number below). This year Tees Valley MG Owners’ Club is hosting another fantastic run of 80 miles through some of the most beautiful scenery you can find. There will be winding roads, narrow bridges, steep hills and picturesque villages which have become the trademark of this annual run. Start and finish at Middlesbrough Motor Club, Coulby Newham, Middlesbrough, TS8 0RP Meet from 9.15am onwards. Tea and coffee available at the start plus a BBQ at the finish. First car off at 10am. Please aim to return by 2.30pm to enjoy the BBQ for the remainder of the afternoon. Last day for entry to guarantee the plaque and tulip route is 30thJune. Entry fee includes route map and BBQ for driver and one passenger. For any further info contact Geoff Brown on (number below) or complete the form below.